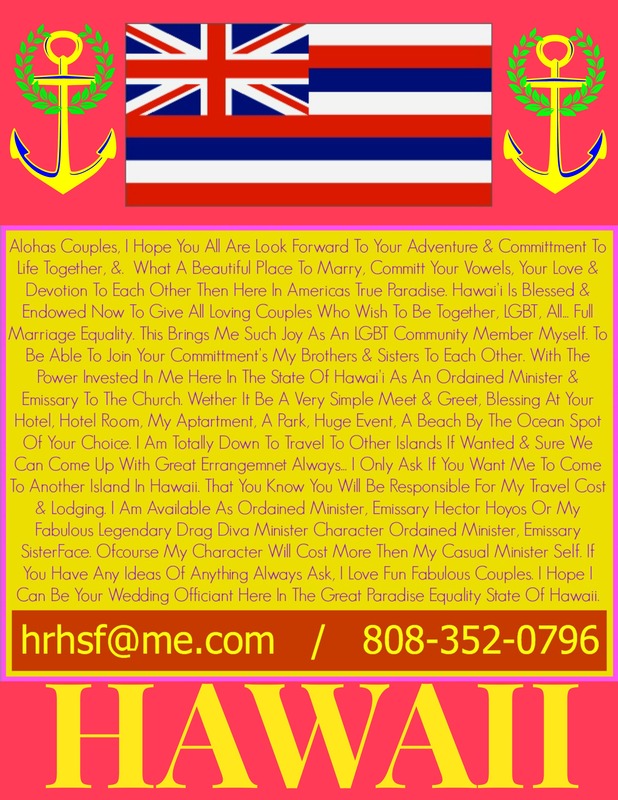 Alohas Fabulous World From Hawaii, Blessings All Loving Couples Wanting To Join In Marriage, Be Blessed In One Of Our Worlds Most Beautiful Places & Paradises, The Hawaiian Islands. 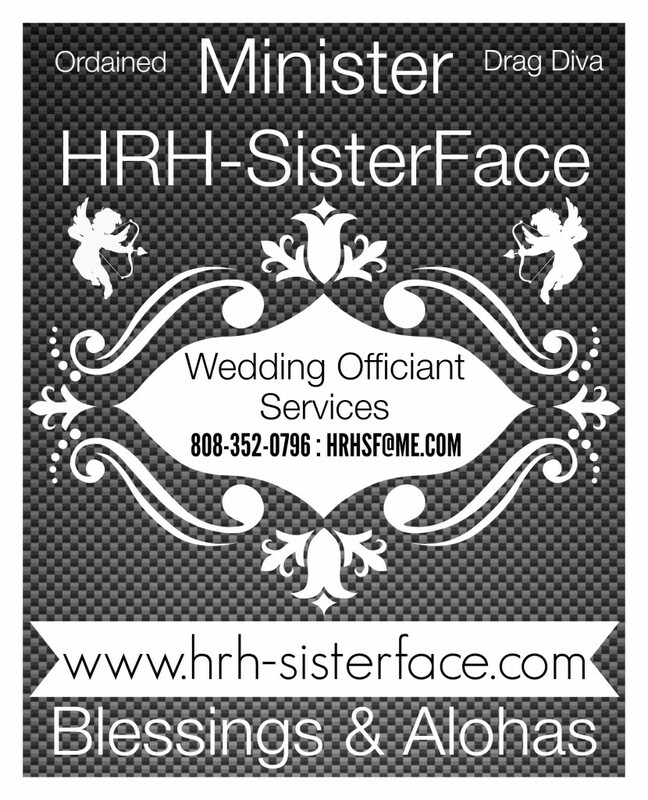 Ordained Minister HRH-SisterFace Is An Openly Gay Emissary. 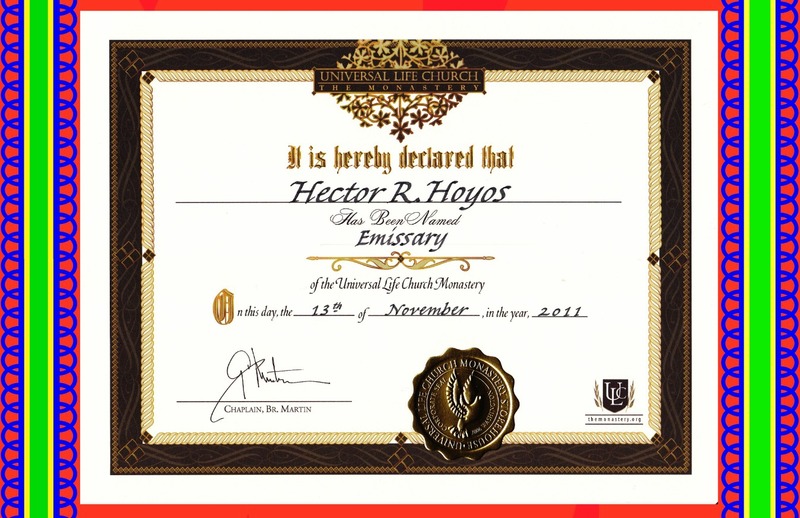 Appointed By The Universal Life Church As A Secular Non-Denominational Minister. My Mission Is To See The Love, Feel Blessed To Spread My Love & Blessings To All Who Want It & Or Need My Heart. 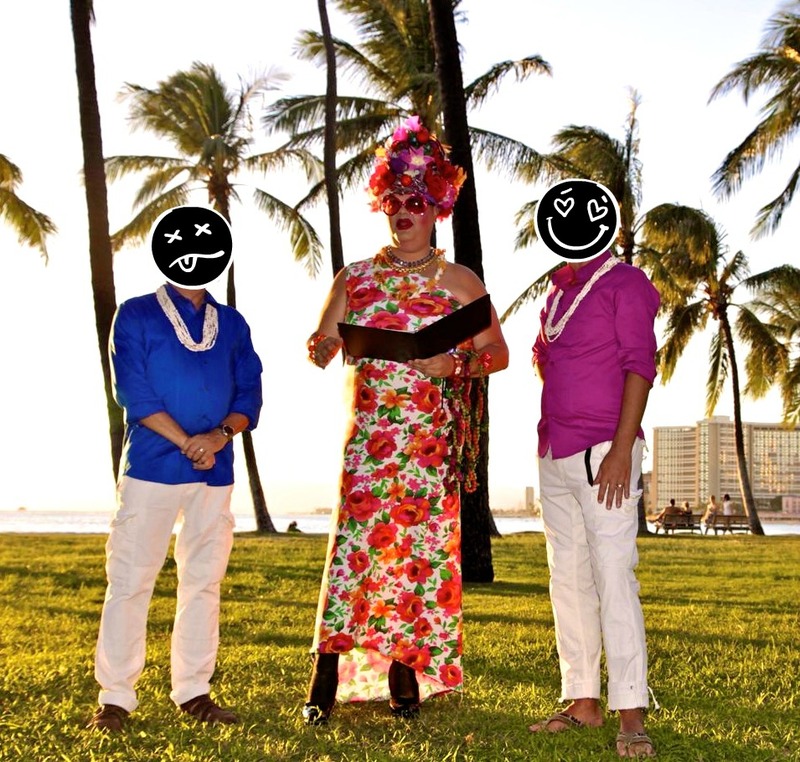 It Would Be My Joy & Honor To Be Able To Marry Loving Couples Here In Our Paradise Of Hawaii. 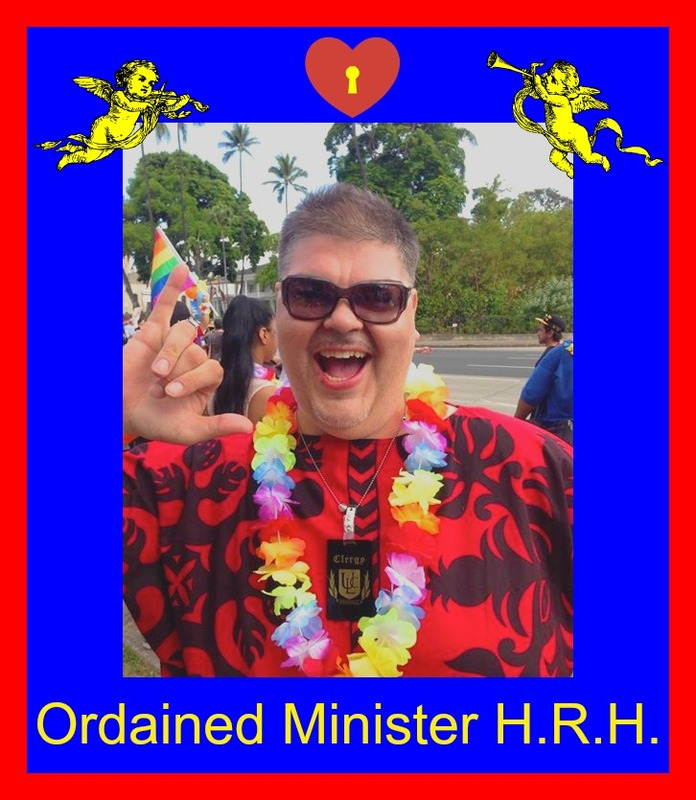 LGBT Couples… History Has Been Made & You Can Feel Proud That Your Minister & Every Persons, Business Links I Might Have To Assist You In This Perfect Day, Your Love. Are People Who All Fought Hard For The Right For All To Marry & Be Recognized Under The Law. 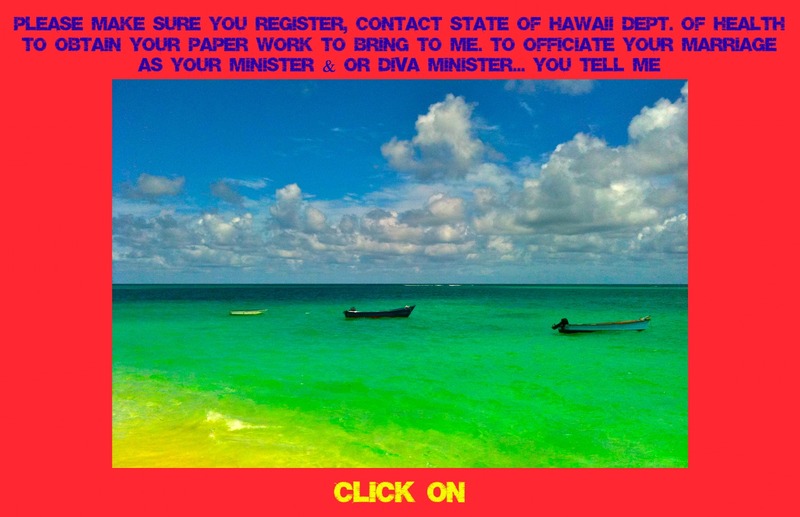 How Joyous Is That, Beautiful Hawaii State Leaders & Many People & Groups Made This Possible For You. I Hope I Get The Chance To Marry Many LGBT Couples Who Need My Services. 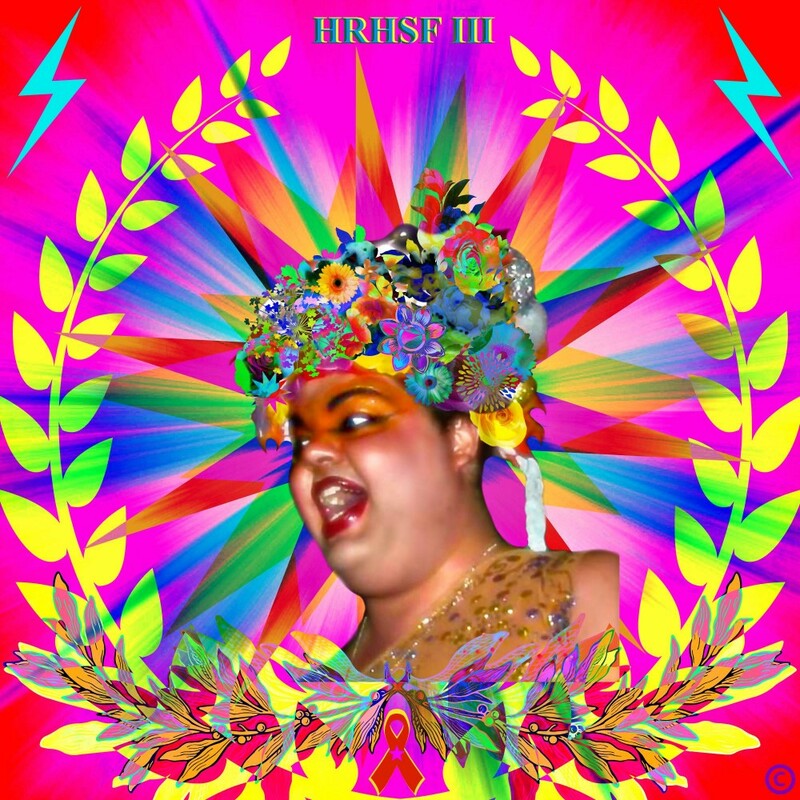 December 2nd 2013 Is The Day “LGBT” Couples Can Start To Legally Wed / Marriage, Be Joined As One, Start A Beautiful Family & Share With Your Friends. 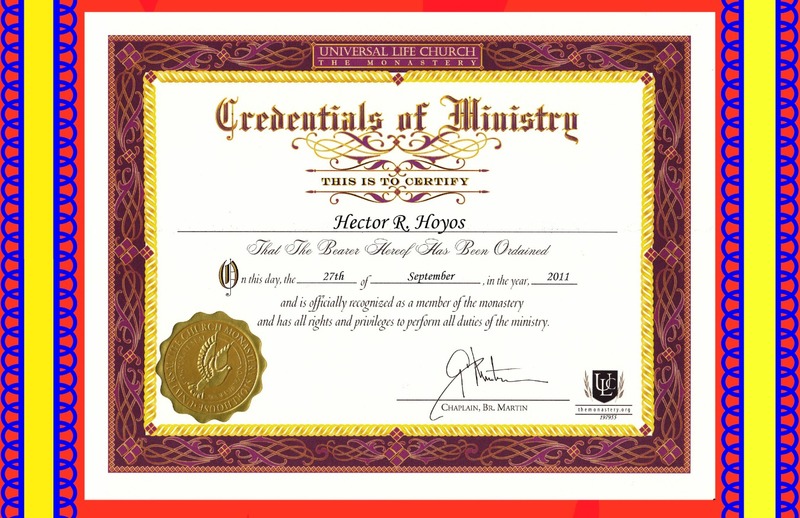 I Am Completely Able To Be Your Quick Fabulous Minister HRH With A Signing & Quick Blessing Solemnization Or More Involved Writing Of Personal Vowels, Meet & Greet Get To Know You Both For An Hour Or So, You Know Me. Maybe Poetry, Maybe You’ll Have Your Own Words. 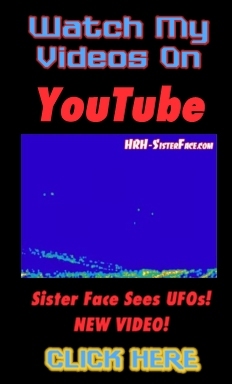 That You Both Need Witnessed & Blessed Or A Simple Hotel Meet Up, Park, Beach, View You Love. 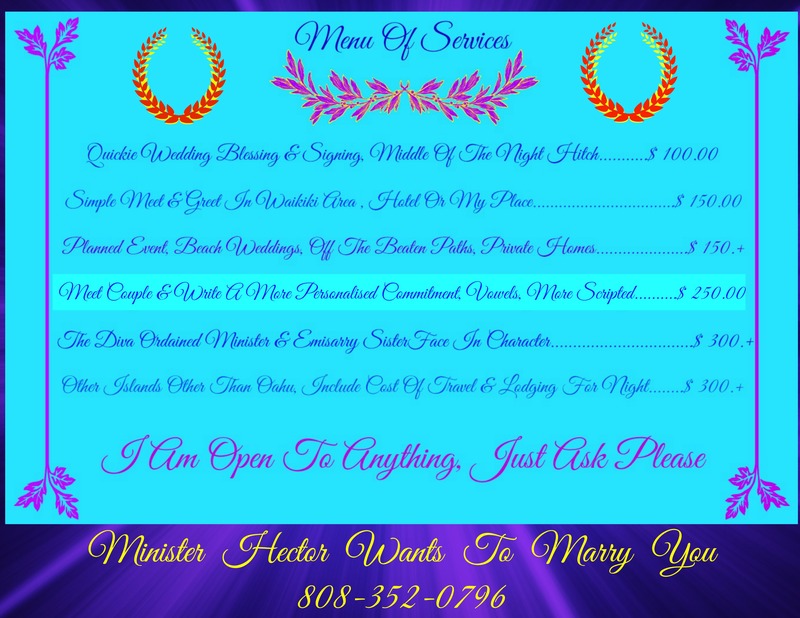 I Hope I Can Help You In Anyway I Can To Be Affordable To Your Budget & I Have Several Options Listed Below On A Menu. 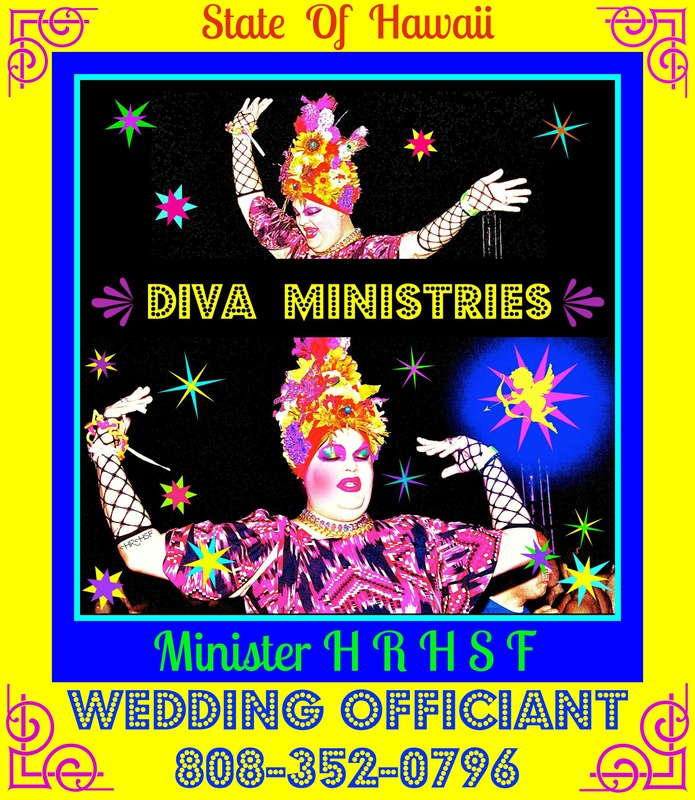 I’m Always , Always Available To Perform Weddings As My Character Drag Diva Ordained Minister SisterFace. 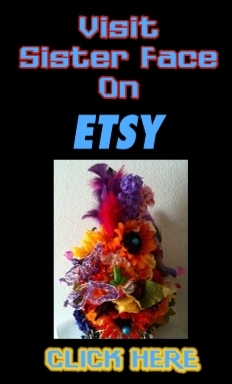 I Would Love Those Fabulous Colorful Clients & Fun Couples Always. 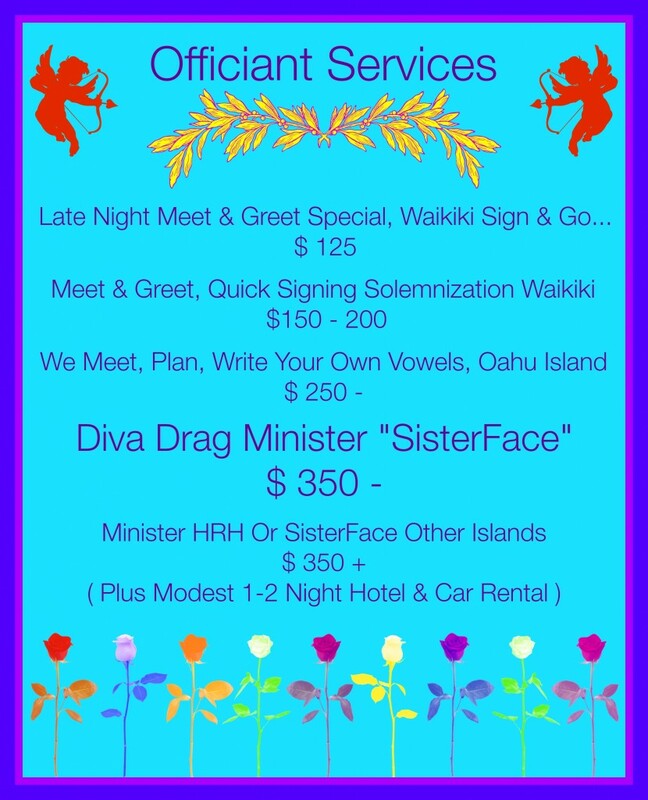 So Whether It Be Private In Your Home, Hotel Room Or Over The Top Star Studied Event Of A Wedding I’m Your Fabulous Very Vibrant Colorful Minister & Will Love Helping Make Your Day A Fierce Blessing. I Love To Be Flown Into Weddings On Other Islands & Would Feel Blessed if You Would Want My Service. Prices Would Then Include Modest Lodging & Travel Expenses, If In A Home Or. Extra Bedroom To Help You Save On Other Islands Than Oahu To Bring Me Over, I’m Fine With That Also.